A black and white cat sitting on a porch with a front yard fill with weeds. This particular house appears to have no one living in it. I've seen some people working on it, so I'm about 75% sure there isn't a dead body in there of someone who died months ago. I walk by and wonder often what it's like on the inside as wild growth continues to consume the outside. 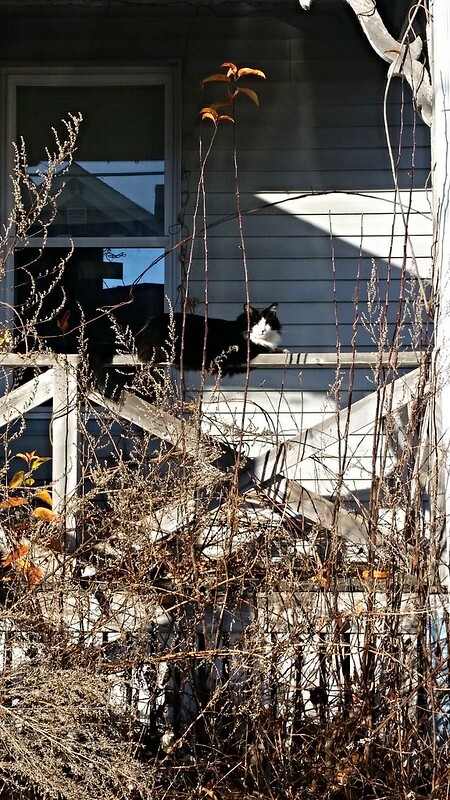 Apparently, I'm not the only one curious as this cat has taken the time to start sunbathing on the porch, probably figuring it is a nice high-up place where it can take in the sun and have several escape routes. It's times like this that I wish I had a better camera or knew more about photography because I feel like I could probably have done some more intriguing shots that focused in on the cat but captured the decaying house.